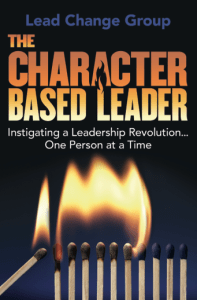 If this book is out-of-stock on this website, you can also purchase copies from the book site at http://characterbasedleader.com. Each character-based leader is unique, bringing their best “self” to make a positive difference. This unique work aligns 21 different author’s perspectives on aspects of character-based leadership in a manner designed to inspire you to be the leader you can be. The Lead Change Group is a nonprofit global community dedicated to instigating a leadership revolution that encourages, energizes and equips people to apply character-based leadership to lead change. Learn more at http://leadchangegroup.com.